The LG LD450EAL is a medium capacity dehumidifier for home use. Its water extraction rate of 45 pints per day makes this unit suitable for smaller spaces than the 65 pint LD650EAL. Many users select room dehumidifiers for use in their basements and a room dehumidifier will perform adequately in such an area provided it is not subject to prolonged periods of relatively low ambient temperature, below 65°F. Although bearing a family resemblance to the larger unit this machine has a quite different appearance as its finish is light grey rather than black. More important, of course, is its performance and this dehumidifier has attracted a a significant number of negative comments from users. Since this dehumidifier is essentially the LD650EAL with a lower moisture removal capacity is not surprising that most of the problems encountered are similar to those reported with the larger dehumidifier. 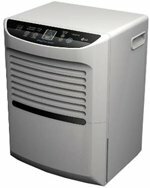 The LG LD450EAL Dehumidifier has a moisture extraction rate of 45 pints every 24 hours. As LG subscribe to the testing conditions laid down by AHAM (Association of Home Appliance Manufacturers), 80°F and 60% relative humidity, this is a reliable indication that the performance of this dehumidifier will be comparable to any other dehumidifier with the same quoted capacity. A dehumidifier of this size is designed for use in a single room of small to medium floor area and should not be considered sufficient for a whole home; a fact confirmed by LG in the owner's manual for this model. In common with the larger LD650EAL the indications from customers are that they are completely satisfied with the ability of this dehumidifier to remove large amounts of moisture from the air. The water collection container, the bucket, is the same size as that in the larger model with a capacity of 21 pints. The lower water collection rate of the LG LD450EAL should mean that this bucket has to be emptied less frequently than that in the bigger unit. Users have experienced the same difficulties in removing and replacing the bucket and in some reviews have reported the added problem of the air filter slipping out of place when attempts are made to remove the bucket, further complicating the procedure. As an alternative to emptying the bucket it is possible to enable continuous drainage by attaching a length of hose to an outlet port in the casing of the LG LD450EAL. The drainage feed is by gravity alone so it is important to ensure that the hose slopes downward over the whole distance to the drain. We always advise our visitors that gravity fed continuous drainage will operate more effectively if the dehumidifier is raised a foot or two above floor level. In a couple of reviews users have reported that without this extra elevation the water fails to drain and backs up into the bucket of this dehumidifier. Once again the attachment of the hose to the dehumidifier is reported to be insecure with the risk of spillage. This appears to be a design fault with this series of dehumidifiers. The LG LD450EAL incorporates an adjustable humidistat to control the level of relative humidity to your requirements. It may be set at any level from 35% to 70% in increments of 5%. This is an important feature as it saves energy by switching off the compressor, the main energy consumer, when the programmed level is reached. It is also important since relative humidity must be maintained at 50%, or a little lower, to control condensation, prevent mold growth and make your home uncomfortable for dust mites. We caution regularly that the accuracy of the humidity sensor in room dehumidifiers is often approximate and that investment in a separate hygrometer is advisable. We note in one review that the customer had purchased two LG LD450EAL dehumidifiers and was operating them both in the same basement. His experience was that one unit was sensing 35% RH while the other reported 50%, in the same place at the same time. This rather makes the point. It may be helpful to add that refrigerant room dehumidifiers, like the LG LD450EAL, really struggle to reduce relative humidity below around 45% and to keep it there. This is a consequence of the refrigerant process, not a fault in this model of dehumidifier. In typical circumstances there is no need to lower relative humidity below 45% but if you have specific reasons for doing so a more capable, and expensive, dehumidifier will be needed. The LD450EAL is identical in size to the more powerful LD650EAL so, in relation to it power, cannot be considered particularly compact. The weight of the unit is 44.9lb, about 4lb lighter. It is equipped with carrying handles and casters so is equally portable. The LG LD450EAL is equipped with a timer which will cycle the unit on and off ever 2 or 4 hours. The unit also incorporates auto-restart with switches the unit back on following a power outage. On the issue of noise output we find that this is. once again, a common source of dissatisfaction in user reviews. The reported noise level is 52dB, identical to that of the 65 pint model. This is disappointing since a smaller dehumidifier should be quieter, as a rule. Secondary vibration is mentioned in too many reviews for it to be ignored and appears to be a problem with this series. We welcome your comments if you own or have owned an LG LD450EAL. Finally both dehumidifiers have attracted criticism for breaking down less than twelve months from purchase. Once again this comment appears in a significant number of reviews. There have been many negative reviews of this dehumidifier and the common themes we have identified are as follows. Repeated reports of breakdowns in the first one or two years of operation. One recurrent comment is that the dehumidifier is operating but no water is collecting in the bucket. Another complaint is of a failure in the control panel. One reviewer referred to a failure of the fan. Complaints of excessive noise are common. This appears to be a consequence of secondary vibration in areas of the appliance which add significantly to the quoted noise output of 52dB. A third complaint is the degree to which the air returned to the room has been heated above the ambient temperature. A significant number of reviews indicate that the attachment of the drain hose to the dehumidifier is insecure. Where the dehumidifier was operating it was reported to be effective although many who were satisfied with its water extraction capability complained about the noise level. Many reviewers liked the appearance of this dehumidifier. The controls are reported to be easy to use. The number of customers writing dehumidifier reviews of this unit who were not satisfied is greater than the number of satisfied customers. We accept that dissatisfied customers may be more highly motivated to write dehumidifier reviews but we find the balance of dissatisfaction far greater than for many other dehumidifier brands and models. We conclude, therefore, that this represents a real difference in satisfaction levels and that this dehumidifier is less favoured than many others. The substance of the most common complaints, lack of reliability, excessive noise and excessive heating effect, must be taken as an indication that these are real differences between this dehumidifier and other models. The proportion of reviews mentioning these concerns far exceeds that found in similar collections of reviews for other models. Our conclusion is that this dehumidifier is less reliable and noiser than other comparable models and produces more heat. In view of this we cannot say that this dehumidifier represents good value for money and do not recommend it to our visitors. There are other dehumidifiers which we have reviewed which we believe offer better value for money and do not share these disadavantages or do not share them to the same extent. If you would like to consider some other brands take a look at this page for the models we recommend to our visitors.